This is a hearty and flavorful one pot meal, colorful and tasty enough to serve when entertaining guests. It reheats nicely, so it is also a good candidate for preparing on Sunday, with planned leftovers to reheat for a low-FODMAP lunch or dinner during the week. Cut the stems off the Swiss chard and cut them crosswise into ¼- inch thick pieces; set aside, keeping stems separate from leaves. Slice the leaves crosswise into ½- inch ribbons, then chop them into thirds in the other direction. In a large, heavy saucepan or Dutch oven, heat 1 tablespoon of oil on medium high heat. Sprinkle the whole chicken thighs with salt and pepper, and brown them on both sides until golden brown. Remove the chicken pieces to a bowl and set aside. Add 2 teaspoons of oil to the pot and add red pepper, carrot, celeriac, leek leaves, and chard stems to the pot and sauté until softened, 4 to 5 minutes. 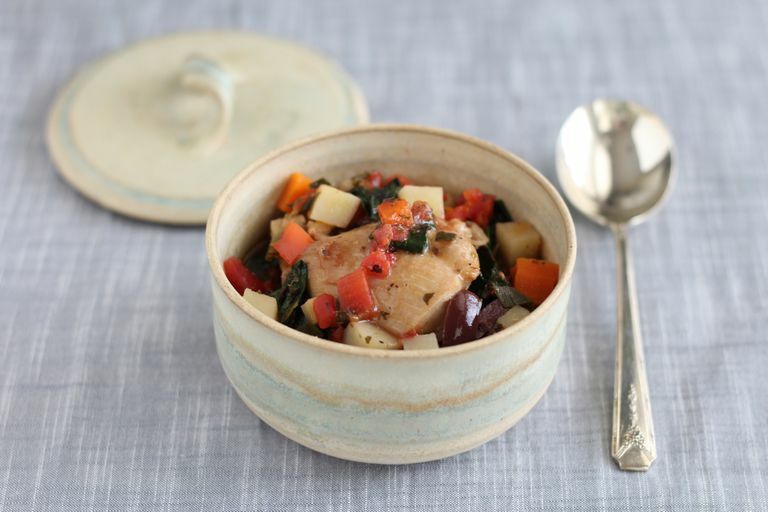 Return the chicken to the pot and add tomatoes with juices, Herbes de Provence, potatoes, and 1 cup water. Cover and simmer for 20 minutes. Stir in the chard leaves and olives, cover and cook until the leaves are soft and potatoes are cooked through, about 5 minutes. Ladle into bowls and serve hot. No Herbes de Provence? Substitute ½ teaspoon dried, crushed rosemary, 1 teaspoon dried oregano, 1 teaspoon dried basil, and ½ teaspoon dried thyme. Substitute 1 small zucchini and 1 medium summer squash for the chard. Quarter the squashes lengthwise, then cut them crosswise into ½ inch chunks. To make this recipe lower in fat, boneless, skinless chicken breasts may be used in place of the chicken thighs. Large chicken breasts should be cut into 2 or 3 pieces each before browning. Swiss chard can be sandy, so wash it carefully, especially the stems. Big eaters might enjoy this stew served over steamed quinoa, millet or buckwheat.